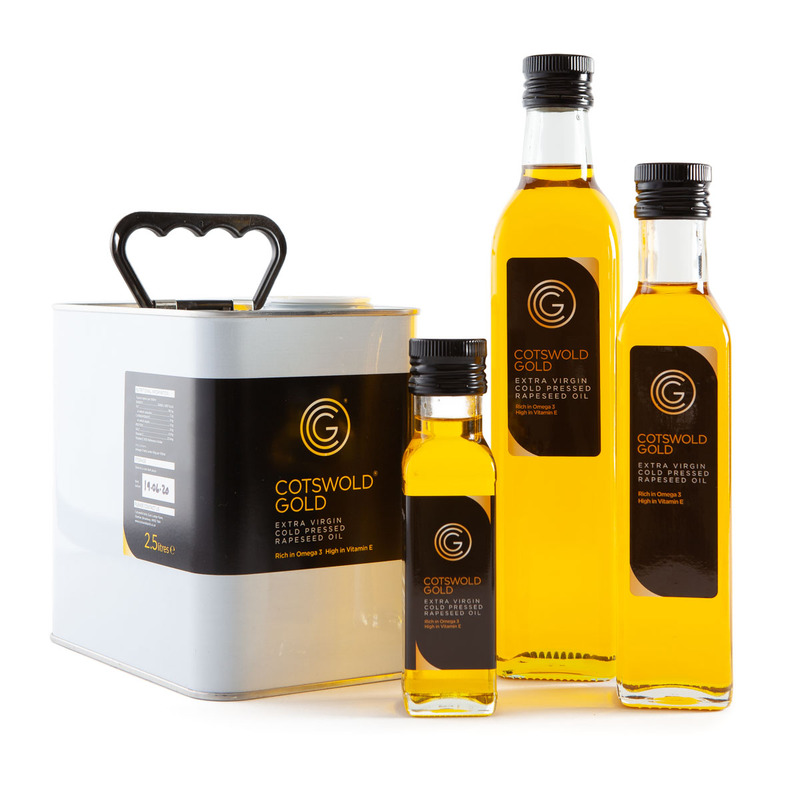 Cotswold Gold Rapeseed Oil 2.5lt can is the perfect size for families. A premium, extra virgin rapeseed oil made using traditional cold pressing methods. We only use crops grown on our family farm in the Cotswolds because this ensures that only the finest seeds are pressed. As a result our Cotswold Gold is a vibrant, golden colour. Excellent product, bought 2.5 litre can at the Good food show in Birmingham and its nearly all gone. I use it for frying roasting and homemade dressings all have been very successful. I am about to order some more! We bought a 2.5 litre can at Herefordshire Food Festival. It is excellent as a local replacement for extra virgin olive oil plus it gets nice and hot so great for stir fry as well as a dressing for salads. Just about to buy some more. I have been using this when I make homemade bread and my loaves have a marvellous texture. It is great for cooking and dressings too. Fabulous oil – we decant in to a pretty glass bottle and it’s a bargain buying this way too. Have always loved this oil but cannot get to the farm now and the local supplier has now stopped selling it which is a shame as it was good to see it in Tewkesbury.Thank heavens for delivery service. Best taste ever. Originally found this at the Good Food Show in Birmingham. Bought various products and now use them all the time. Have gone from buying small bottles, to larger bottles and now to the can. Its a fantastic, versatile product. Can wholly recommend. Originally bought this at Hereford food festival a few years back. Excellent product and as we are on Isle of Wight the fast and efficient delivery service is superb. We use it to make cakes, bread and all types of frying/roasting. Fabulous oil. I decant it from the 2.5 litre tin into an attractive glass jug and use it for absolutely everything. It is the only oil I have used in the last three years. This oil is absolutely delicious! I will definitely buy again. Discovered this product at the Spirit of Christmas event in London many years ago when new to the market. Never contemplate using anything else. Just received latest 2.5 litre tin. Forgot to order the chilli version so back to shop online. I wasn’t impressed with the supermarket Rapeseed oil I had bought previously and dismissed it until I noticed a glowing recommendation of Cotswold Gold by my favourite chef Raymond Blanc. After an exchange of emails with Charlie, who is a most engaging character, he convinced me to give his product a try – I did! The slight pepperiness of Cotswold Gold is reminiscent of Olive oil of course, but I love that. And the fact that it has such a high smoke point, it’s suitable for high temperature frying like stir fries. I’m ‘Sold on Gold’! The 3rd time I have purchased this item & I still love it. Far better & more tasty than the supermarket products. A bit more pricey but it’s worth it. 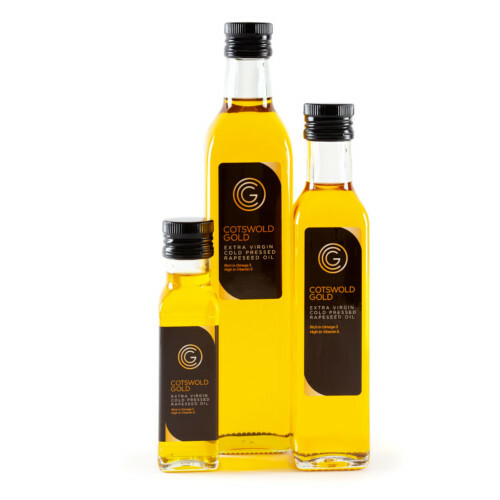 I have been using Cotswold Gold rapeseed oil for over four years now. My preference for rapeseed oil was encouraged by recommendations by some of my favourite chefs. Hugh Fearnley Whittingstall, Raymond Blanc at Le Manoir, Rick Stein and James Martin, It is the oil of choice in the kitchens of the Dorchester and the House of Lords. I buy four large tins at at time, as it has a good shelf life of at least 18 months, and I like to give one tin away as an unusual special present. This beautiful golden oil has higher levels of Omega 3, 6 and 9 than any other vegetable oil and has a ferociously high smoke point of more than 220C, so good for roasting and frying. It has less saturated fat than all other cooking oils. I used to use extra virgin olive oil as well, now I use Cotswold Gold for everything as I love it so much. Like many other reviewers, I decant it into a pretty green glass bottle. We have been using this for the last couple of years now. Great local product. and, bought like this, good value for money. Been using this oil for several years and love its versatility. Second time I have purchased this. Very good quality – would not consider buying any other. My ire and I have been using Gold Oil from this supplier for many years and can recommend it for use instead of water in Breadmaking Machines. The quality is smooth and excellent taste, reliable and a good long life too. Have been using the oil for many years, the best on the market. I’ve bought the cotswold gold rapeseed oil for many years now. I didn’t used to like rapeseed oil until I discovered Cotswold gold at food fair . It’s so delicous you could almost drink it. Makes the best crispy roast spuds ever with the most beautiful golden colour. I now much prefer it to olive oil. Would one hundred percent recommend. This was my first purchase of the 2.5L can of cold pressed rapeseed oil from this company. 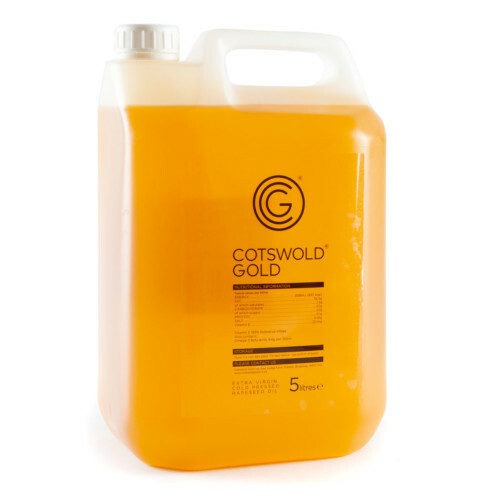 The Cotswold Gold Online service was straightforward and I received my oil in good time. It is a lovely golden green given the seasonality of the product and has a mild peppery note, reminiscent of extra virgin olive oil but without the issue of being unable to cook with it at a high heat. I appreciated the option of a tin to keep the oil out of the light to prolong my shelf life. I will definitely order again. Thank you.